Druids of Faunae are attuned to creatures of the forest as their sisters are attuned to plant life. They spend their lives with the creatures of the forest, and developed a sense similar to theirs; they are able to quickly smell scents in the wind and track enemies through even water. 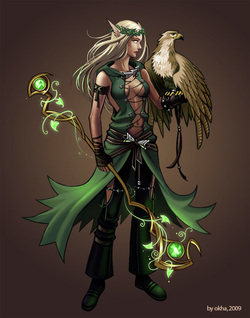 Ysseyra, Queen of the Dryads, was once a Druid of Faunae, and spent her life communing with animals. She, as well as most Druids of Faunae, never used her abilities to hunt, but hunted none the less, believing strictly in a circle of creation. Druids of Faunae have the ability to heal any animal they so choose, giving it back full Health and removing any debuffs from it. This skill can only be used once a day, however.